I’m Celeste Brewer, and I love a good story, especially if it happens to be true. Stories are what drew me to study history and archives. I am fascinated by the layers of narrative and counter-narrative that can be constructed around the narrowest frames of primary evidence, then deconstructed and rebuilt. I love a sweeping historical saga as much as anyone, but I think more than that, I love the strange small anecdotes that get mentioned in footnotes, or not at all. When I get the chance to create the narrative, those are the types of stories I like to tell. I could certainly be accused of dilettantism, but the balance of (relatively) new and old history works for me right now. Sometimes the recent past is just too raw, while other times the distant past is too foreign. If I continue to pursue academic history I suppose I’ll have to choose. However, for now, it makes me a more versatile librarian and archivist-in-training. 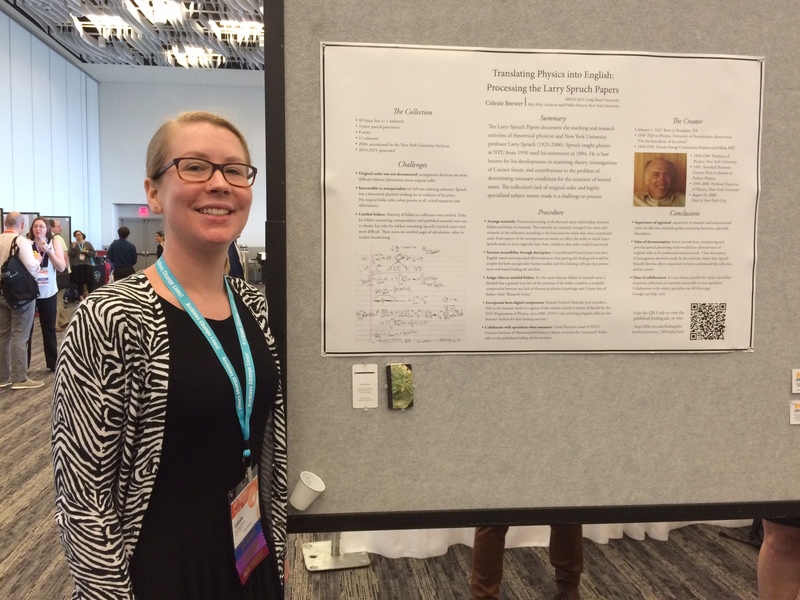 Me in professional mode, presenting a poster at the Society of American Archivists’ annual meeting in August 2015. 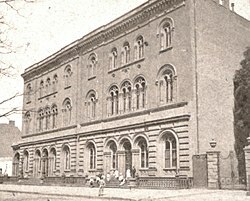 The Astor Library (1849-1895) was one of the first public libraries in the United States. It it remembered for being a well-rounded collection and a revolutionary work of philanthropy. Although its life was short, the books it housed became the nucleus of a library which has become one of largest and most highly regarded in the world; namely, the New York Public Library. Funded by John Jacob Astor’s original bequest of $400,000, the institution subsisted off private donations rather than subscriptions – as was previously the model for public libraries – or tax revenues – as is the current model. The Astor Library was the brainchild of Harvard librarian, lawyer, editor and scholar, Joseph Green Cogswell (1786-1865), who became one of Astor’s close friends and sometimes-secretary during the 1840’s. Cogswell, having studied bibliography and education at Gottingen University among other locations in Europe subscribed to a progressive and democratic ideal for educating the greater populace. Cogswell’s principal “was to follow the wants of the community and to buy such things as could not be found in other New York libraries.” Through Cogswell’s influence, the library grew to be regarded as one of the best collections in the United States, although its limitations in size and funds meant that it could never rival the great libraries of Europe as Cogswell so wished it to. Unfortunately, continuing support of the library was difficult to obtain, and private donations, even from Astor’s heirs, proved inadequate to keep the library afloat. By the 1890’s, the institution was in such financial straits that it saw no way to avoid closure. An amenable alternative was presented by the Tilden Foundation, which suggested the creation of a public, tax-funded institution created using the book collections of the struggling Astor and Lenox Libraries. This amalgamation became the New York Public Library, established in 1895.